It’s been said that Excel is the poor man’s database. I don’t know about that, but I can tell you that an awful lot of data lives in Excel spreadsheets in corporate America and around the world. Whether it’s project timelines or employee lists, many business depend on Excel. This is evident in my consulting practice. It’s also commonly mentioned when I’m teaching Microsoft SQL Server Reporting Services courses for clients. Students want to see an example of a report that uses a Microsoft Excel Spreadsheet as its datasource. 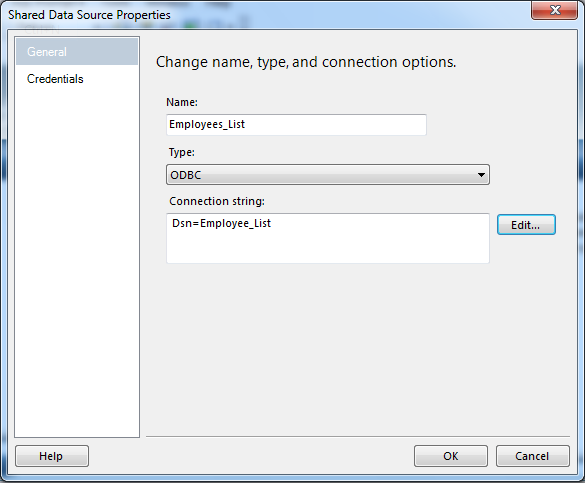 The first step in using an Excel spreadsheet as a datasource is to create a System Data Source Name (DSN) for the spreadsheet. 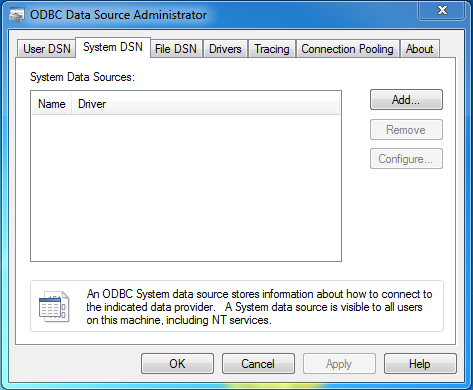 Open the Data Sources (ODBC) applet from Control Panel | Administrative Tools. Of course the name and location of the applet can change depending on the version of Windows you’re using. 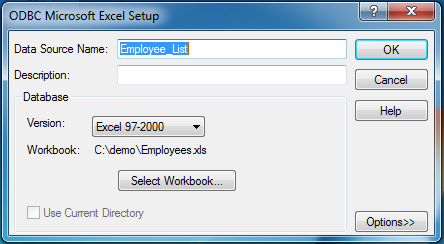 Add a new System DSN, providing a name in the Data Source Name box, and selecting the workbook that you wish to use for your report. 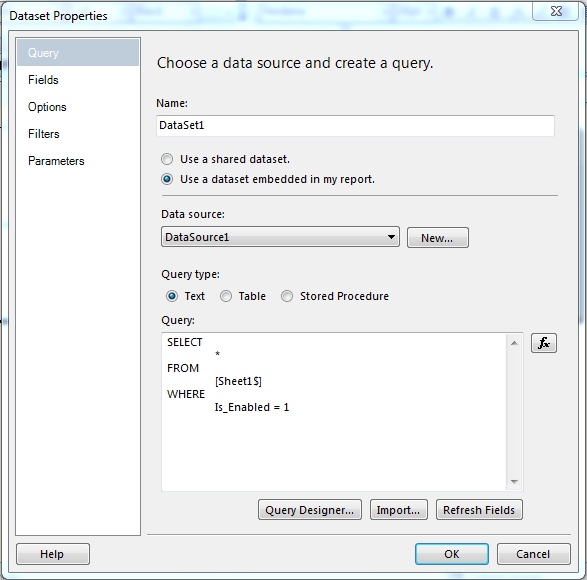 Next, from within Business Intelligence Developers Studio (BIDS), create a new data source. Change the Type to ODBC. Click the Edit… button and select the DSN that you just created in the prior steps. Note that you can replace Sheet1 with the actual name of the worksheet tab in the Excel Workbook. The syntax requires that the name of the worksheet be followed by a dollar sign ($). As such, you must enclose the worksheet name in square brackets  as shown below since a dollar sign is not considered a valid character in a select statement. Once we’ve created the Dataset, we can display it in a report like any other Dataset. And there you have it, a Reporting Services report that uses data stored in a Microsoft Excel spreadsheet as the source of its data. Six months ago, I spoke at a SQLSaturday in Orlando, Florida. I had a great time. Andy Warren (Blog | Twitter), Jack Corbett (blog | Twitter), and the rest of the team from the Orlando SQL Server User Group, OPASS, did a great job putting together a fantastic event. My hat’s off to them for the effort and results. And I’m glad to see that they’re already working on this year’s event. And speaking of Orlando, next Tuesday, the 13th of April 2010, I’ll speak at the OPASS User Group meeting. I’m delivering a session on Reporting Services. Here’s the abstract. Providing information to those that need it when they need it is key for many businesses. But, being able to automatically disseminate critical information in a timely fashion can be a challenge. In this session, we will discover how data-driven subscriptions in SQL Server Reporting Services can be used to effectively deliver reports to a varying list of subscribers. You can join me from the comfort of your own living room via LiveMeeting. We’ll start at 6:45 EDT. I have my license here somewhere, officer. Licensing models can sometimes make database modeling seem trivial. Per processor or per seat? Single core, dual-core, multi-core processors? Multiple instances on one server? Virtualizing servers on a single server? Active / Passive clustering? It can get very confusing, very quickly. Recently, I was asked by a former student about licensing for a SQL Server Reporting Services instance. In the proposed scenario, the Report Server would be installed on one server and the back end database would be installed on a separate, remote server. How many licenses of SQL Server are required? In short, each server where a Business Intelligence component is installed requires a valid SQL Server license. So, a remote database deployment scenario where the Report Server is installed on one server and the ReportServer database is installed on a separate server requires two licenses of SQL Server. But don’t take my word for it. Here are a couple of links that will help clarify licensing requirements. Got any licensing stories you’d like to share? I’d love to hear about them. Many organizations collect data, lots and lots of data. We have the opportunity and ability today to collect more data than ever before. The challenge is turning the massive amounts of data into usable and actionable information and putting that information into the hands of those who need it when they need it. To do that effectively requires some forethought and planning. Unfortunately, many organizations stop at the data collection phase. Transforming the data into information and reporting that to users is almost an afterthought. The result is static and hard-to-interpret reports similar to the financial ledger books of the days of old. Business Intelligence Developers Studio for Microsoft SQL Server 2008 Reporting Services, BIDS for short, makes creating engaging and dynamic reports nearly trivial in many respects. You can easily create drill-down reports that allow users to initially see a high-level overview of the information they need and then drill down into specific areas of interest with just a few clicks of the mouse. You can also create drill-through reports that allows users to seamlessly navigate from one report to another. One dynamic feature that many users find very useful is known as Interactive Sorting. With Interactive Sorting, users can click on column headings in the Tablix data region and have the report automatically sort by that column. Let’s walk through a graphical example to demonstrate. Here’s an example of a contact phone list report created in BIDS. 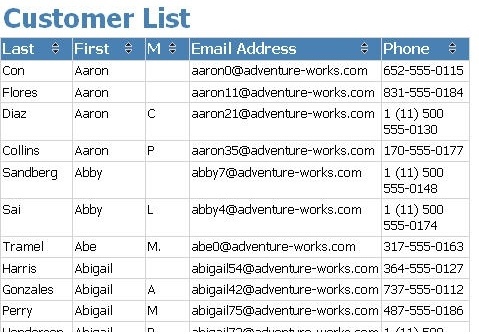 It lists contacts from the sample Adventureworks database using a Tablix data region. 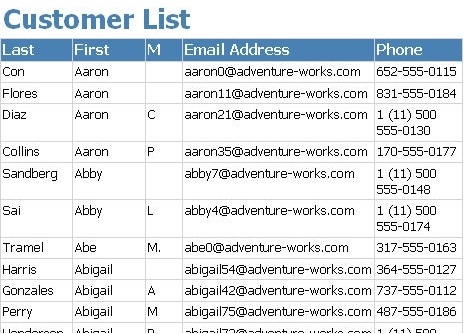 Right now, the report shows the list of customers in no particular order. Let’s provide a way for our users to sort the list as they wish. In the Layout view, click the Tablix header cell for the Last Name column to select it, right click, and then choose Text Box Properties from the context menu. A new window will open. Click on the Interactive Sort link on the left hand side of the window. 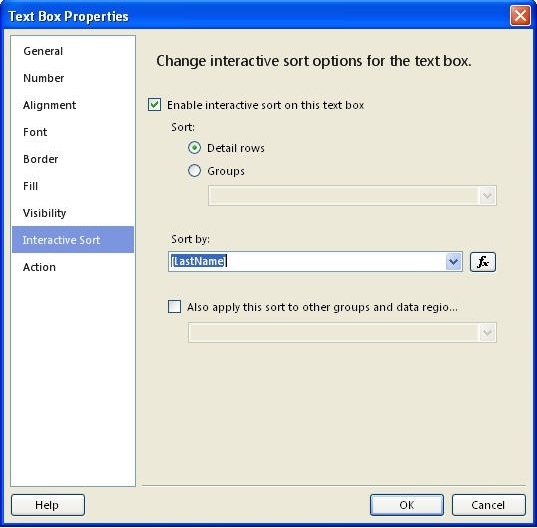 To allow users to dynamically sort the report, check the Enable interactive sort on this text box check box. For this simple example, we’ll sort on the Detail Row by the LastName column. Click the Ok button to save the changes and close the window. 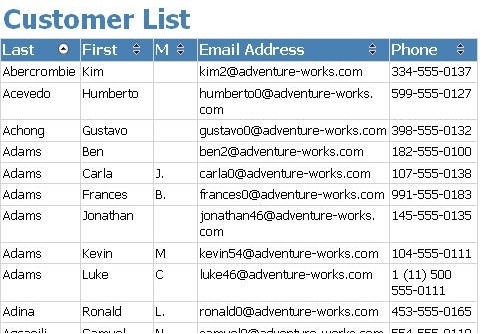 Repeat the process for each column you would like to have sortable. In this example, we’ll enable it for every column in the report. When we preview the report again, you’ll notice that each column now has a couple of arrows in the header. By clicking on one of the column header arrows, the sort order of the rows will dynamically change. And there you have it. With only a few mouse clicks, we’ve enriched the experience our users have while viewing this report. Of course, this technique only works when the report is rendered in formats that support interactivity. When being viewed as a TIFF, for example, the user will not be able alter its presentation. Licensing models can sometimes make database modeling seem trivial. Per processor or per seat? Single core, dual-core, multi-core processors? Multiple instances on one server? Virtualizing servers on a single server? It can get very confusing, very quickly. I’m regularly asked by a former students, clients, and people in the Forums about licensing for a SQL Server Reporting Services instances. A typical question is: How many SQL Server licenses are required when the Report Server is installed on one server and the back end database is installed on a separate remote server? Here are a couple of links that help describe the SQL Server licensing models. And by the way, the answer to the sample question? Each server where a Business Intelligence component is installed requires a valid SQL Server license. So, a remote database deployment scenario where the Report Server is installed on one server and the ReportServer database is installed on a separate server requires two licenses of SQL Server. Cheers and I hope this helps! I could use a clarification here. Having any SQL Service run on a separate server makes sense that it would require an additional license. However, I’m under the impression that having the web components run on a different server does NOT constitute a SQL Service and therefore would NOT require a separate license. It seems like if you want to install reporting services web components (the site and the web service) on a different server where SQL Server 2008 is installed then you will need an other license. Email Email is not required, but it must be valid if specified. Url Url is not required, but it must be valid if specified. In most Microsoft SQL Server Reporting Services (SSRS) implementations, there are dozens, if not hundreds, of reports available for viewing. These reports provide glimpses into the sea of data that the organization collects. From these reports hopefully trends can be discovered and better decisions can be made. At least that’s the goal. There are many attributes of a good report. Broadly speaking the report must be based on accurate data, it must be delivered in a timely fashion, and it must be presented in a way that is easily consumed and interpreted by the users. Unfortunately, many report developers focus exclusively on the first two elements – making sure the data is right and that the report doesn’t take too long to run. Those are important, of course, even essential. 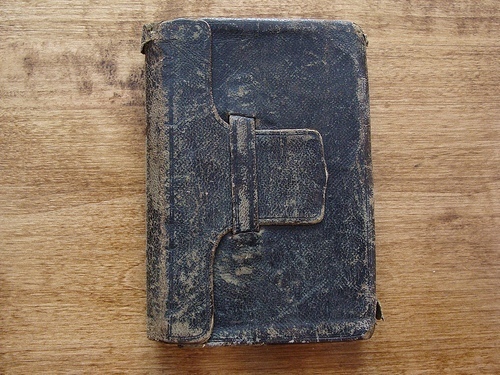 But often the presentation of the report is relegated to an afterthought. Data is slathered on a report form for the user to do with what he pleases. The topic of report presentation best practices is a broad one, far too broad to cover in just one post. Perhaps, I’ll tackle some of these issues in a series of posts in the coming months. In the meantime, there are minor and easily implemented improvements that can be added to reports that will make them immensely more readable. For example, consider a report based on a table data region with row after row of information. Let’s say it’s an employee phone list report as shown below. To make the report a little easier to read horizontally, we’d like to change the background color of every other row. To do so, let’s highlight the detail row of the data table in the layout tab. 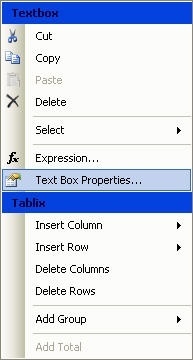 In the properties window, find the BackgroundColor property for the highlighted row and choose <Expression…>. Add the following conditional formatting statement in the Edit Expression window. Click Ok, and preview the report. And there you go, a report that alternates the background color for each row. This makes it much easier to read. But a word of caution: give some consideration to what the users will do with this report. If it’s likely to be printed, the alternating background color will consume additional toner or ink making the report more expense to print. In that case, consider using a single underline between each row. What tips do you have for make reports easier to read?